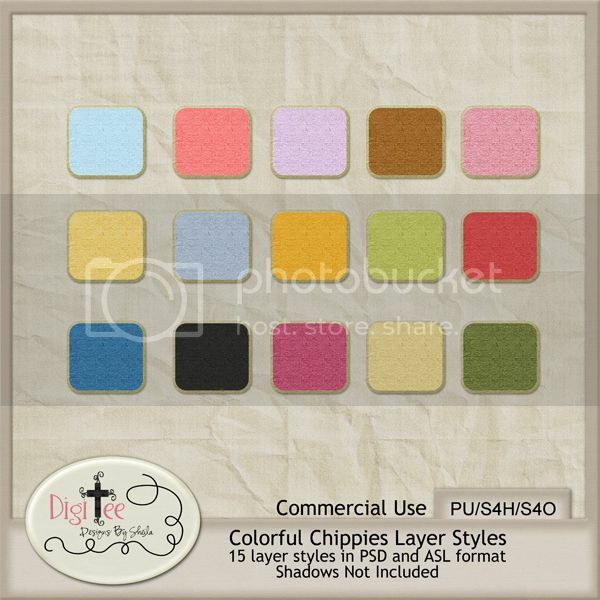 DigiTee Designs By Sheila: CU Colorful Chippies Layer Styles Freebie! always, please leave some love, I look so forward to the comments:) Also, if there is something you'd love to see for free, let me know, maybe I can whip it up for ya!! I love to design and share!! May God bless you all today! DOWNLOAD PSD FORMAT at mediafire. DOWNLOAD ASL FORMAT at mediafire. Thank you so much for this post. I want to let you know that I posted a link to your blog in CBH Digital Scrapbooking Freebies (please, notice the new url for my blog), under the Page 2 post on Jul. 17, 2012. Thanks again. Thanx so very much for sharing all the styles and layers! Appreciate your generosity!